Engagement session here in Charleston Sc, are so much fun, we have so many backgrounds, and locations to work with, in this beautiful city of ours. A couple of years ago my clients, wanted for me to capture just that, but the greatest part of it was that they were going to add some interesting feel to the mood of a basic engagement session. In Charleston, Sc, we have various beaches to choose from, and back during hurricane Hugo, many ships washed into shore, most of them were fixed and transported back to shore, some of them got taken apart, and one of them got to be left alone. Has you are driving and heading towards Folley Beach you will find this deserted boat, and one of the tradition for this boat it that people are known and allowed to paint on the boat. 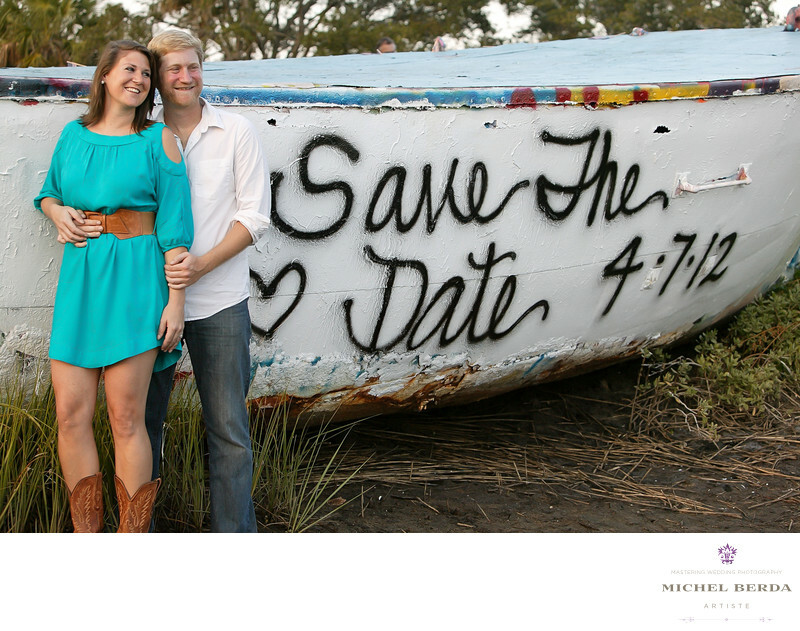 For this engagement occasion my clients used it and painted it, for there saved the date engagement photos.As a Charleston, Sc, Engagement Photographer, the catch to capturing the perfect image for them to use as a saved the date card, was using the correct lens that would give you the proper aspect ratio to include your clients and this very long boat. Once again with my fisheye, I was able to take my clients to the left of my frame, and have the negative space with what they painted on the boat. It was a brilliant idea from my very nice clients, and well captured engagement image and resulted in them using this image for their save the date card.Keywords: Charleston Engagement (3).